Right after the start of a fight, sweeping the opponent’s inside ankle to throw him off balance and forcing him down to the ground. 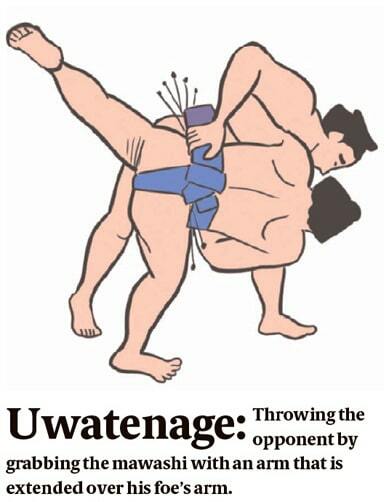 After unleashing a throw, sweeping the opponent’s ankle and pulling him down backward to the ground. After unleashing a throw, grabbing the inside thigh of the opponent’s near leg and lifting it up,Sending him off balance. 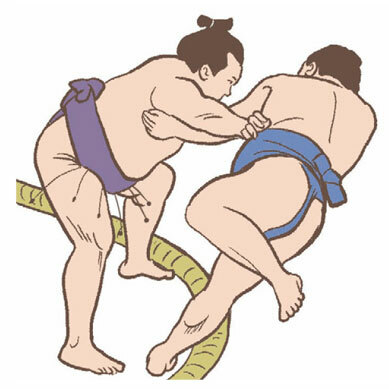 Holding the opponent’s mawashi and forcing him backward to make him collapse out of the ring. 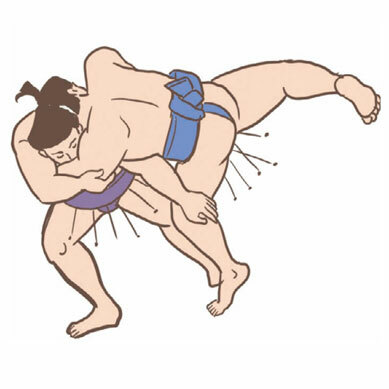 Grabbing the knee of the opponent’s inside leg and twisting him down to the ground. 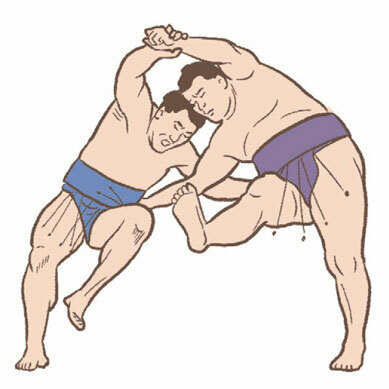 Grabbing the knee of the opponent’s outside leg with the upper hand and twisting him down to the ground. 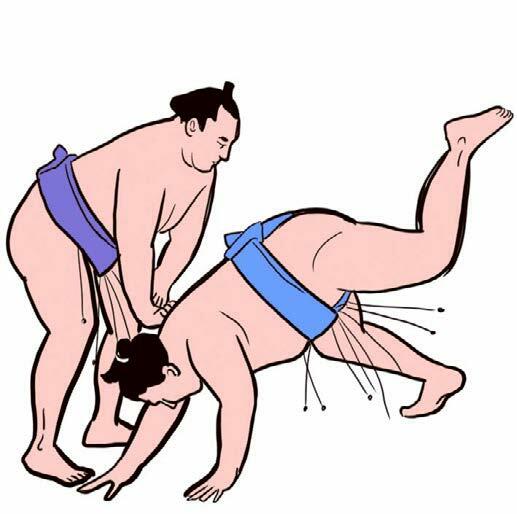 Extending an arm under the oppo-nent’s underarm while stepping aside and throwing him down to the ground without grabbing his mawashi. 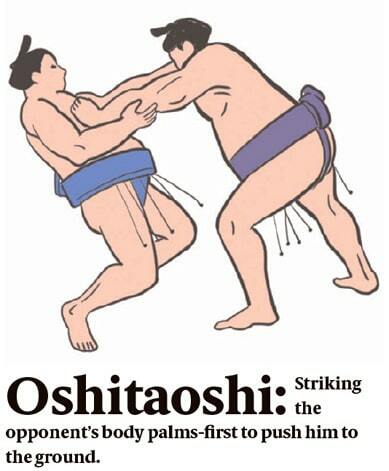 Pushing the opponent on his chest, throat or underarms to force him out of the ring without holding his mawashi. 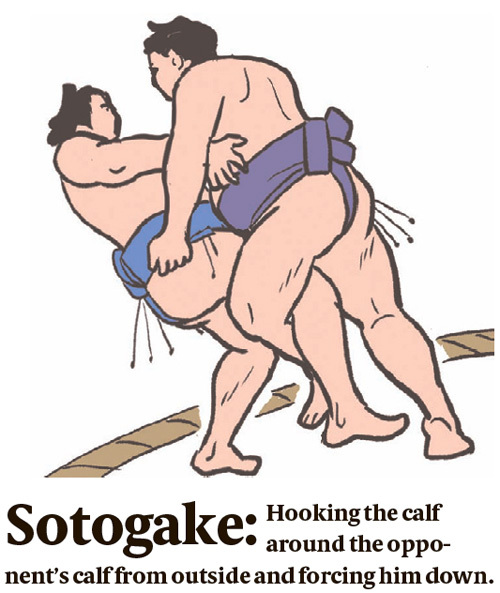 One of the popular kimarite in sumo. 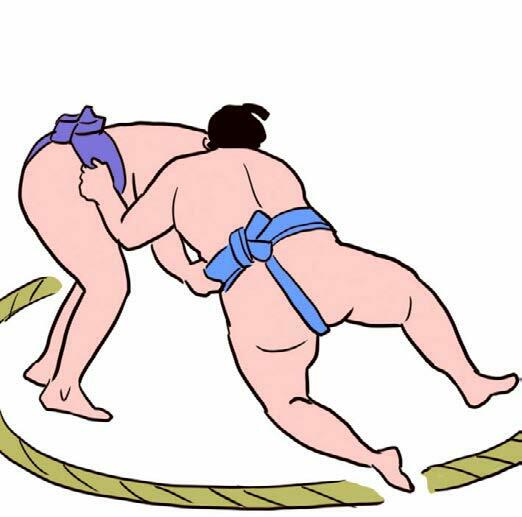 If the opponent falls down, it is called oshitaoshi. Pushing the opponent’s face or chest to force him out of the ring with one or a series of palm thrusts. Slapping down on the opponent’s shoulder or back to force him down to the ground. 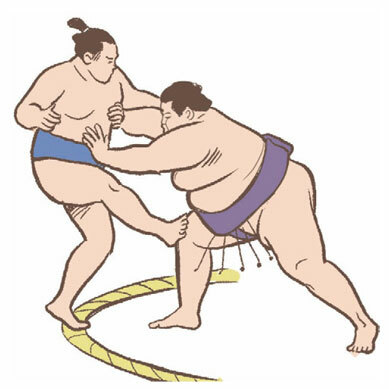 Grabbing the opponent's mawashi over his arm and twisting him down backward to the ground. 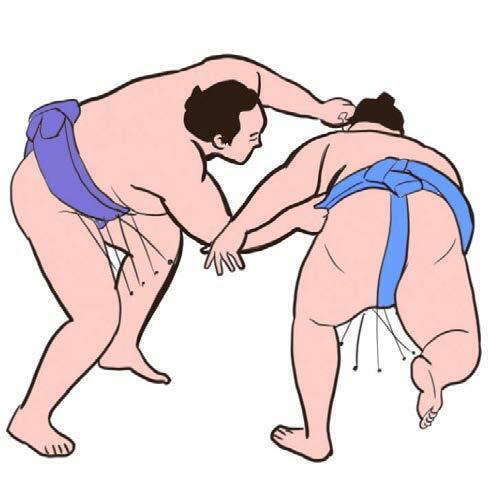 Grabbing the opponent's mawashi under his arm and pulling him down forward to the ground. 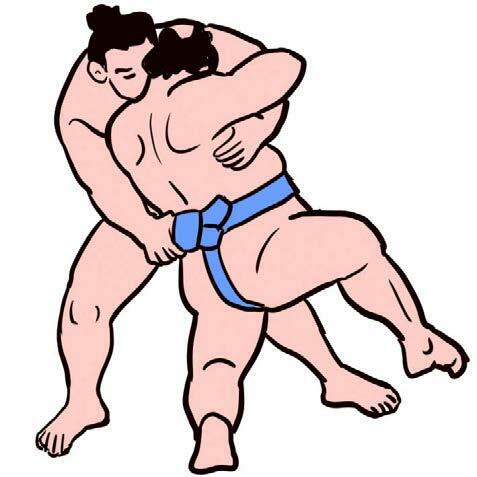 Wrapping an arm around the opponent's arm and throwing him to the ground without grabbing his mawashi. 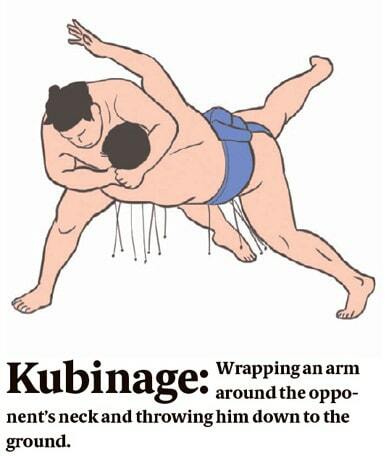 Grabbing the opponent's mawashi over his arm, then throwing him down. 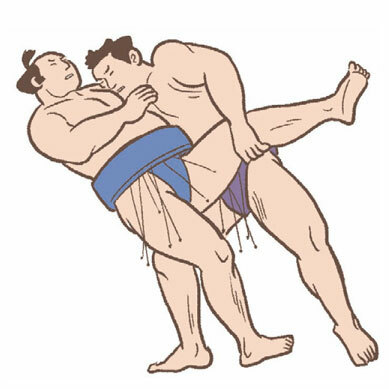 Grabbing the opponent's mawashi under his arm, then pulling him forward and down. 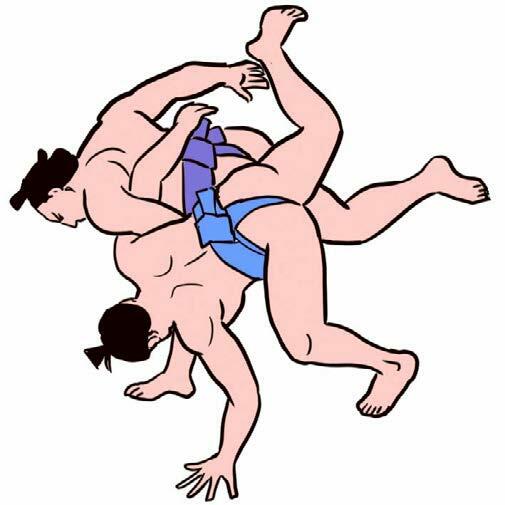 Grabbing the opponent's leg with both hands and leaning forward to force him to go off balance and fall down. 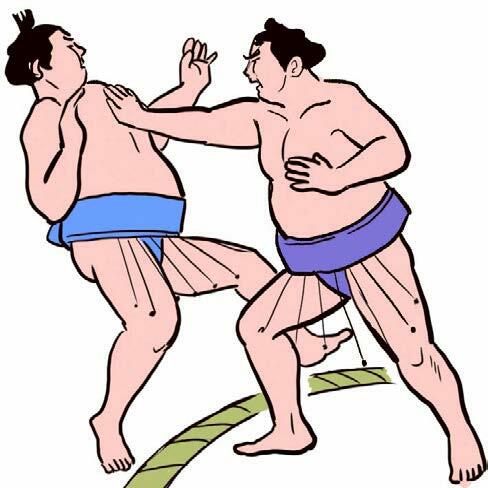 Extending an arm under the opponent's arm to grab the opponent's mawashi, then throwing down the opponent while turning sideways. 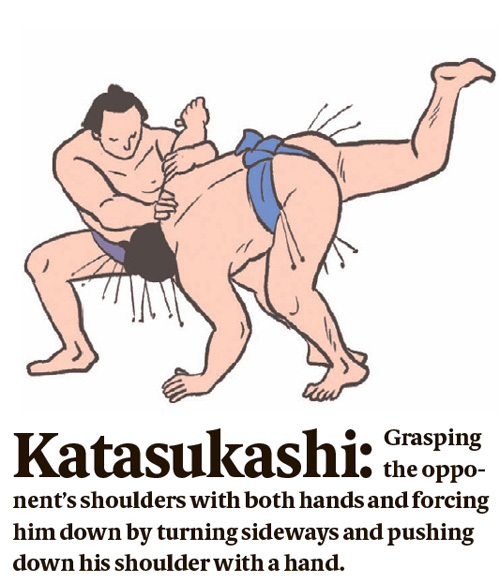 Grasping the opponent's shoulders with both hands and forcing him down by turning sideways and pushing down his shoulder with a hand. 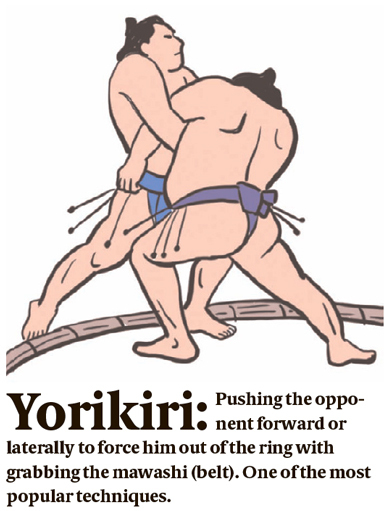 Lifting the opponent by grabbing his mawashi and forcing him out of the dohyo. 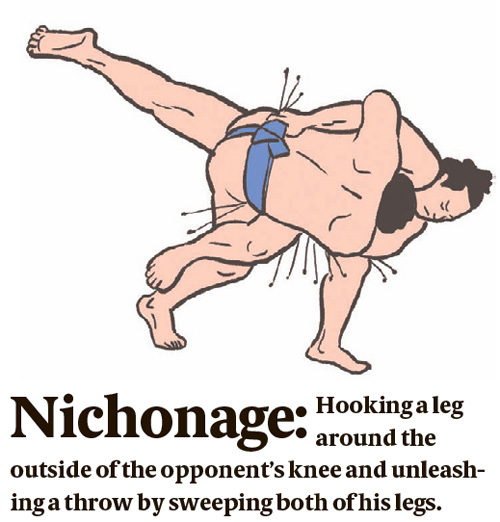 Hooking a leg around the outside of the opponent's knee and unleashing a throw by sweeping both of his legs. Hooking the calf around the opponent's calf from inside and forcing him down. Hooking the calf around the opponent's calf from outside and forcing him down. 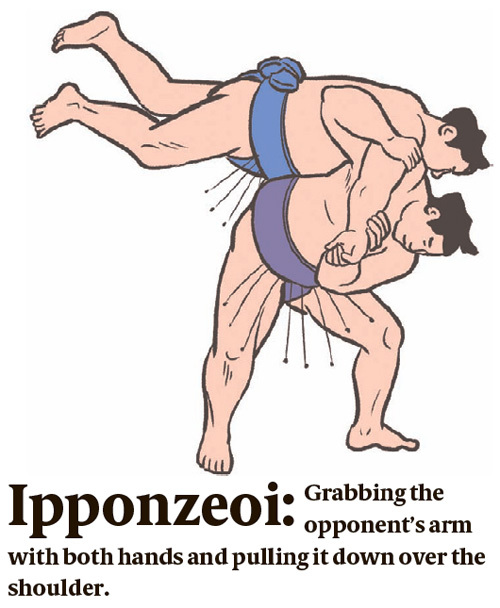 Grabbing the opponent's arm with both hands and pulling it down over the shoulder. 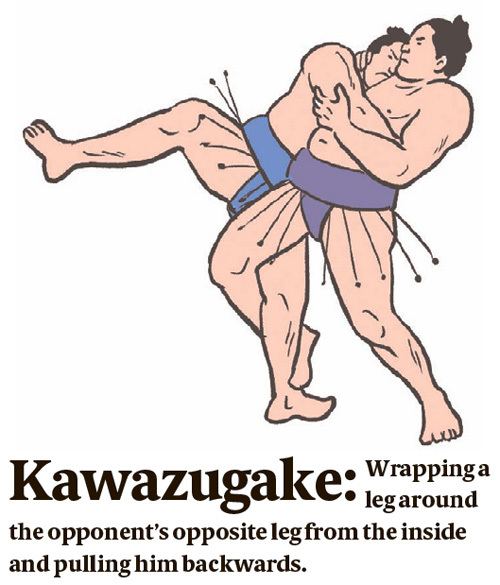 Wrapping a leg around the opponent's opposite leg from the inside and pulling him backwards. Forcing the opponent down on his back by leaning on him. 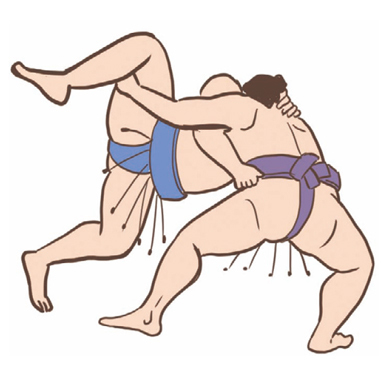 Grabbing the opponent's legs and pulling upward with both arms, causing him to fall over. 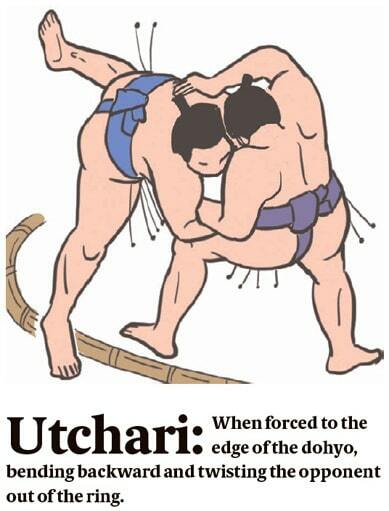 When forced to the edge of the dohyo, bending backward and twisting the opponent out of the ring. 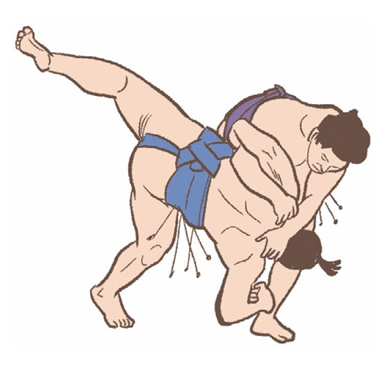 Wrapping an arm around the opponent's neck and throwing him down to the ground. 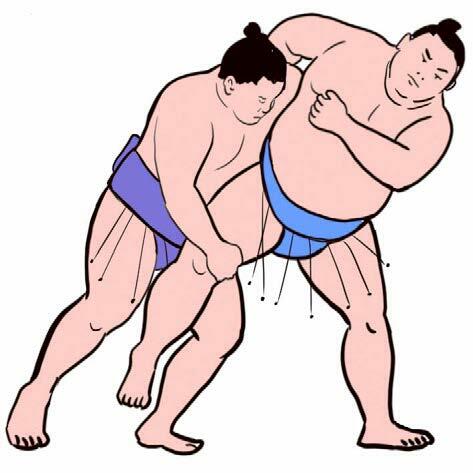 Throwing the opponent by grabbing the mawashi with an arm that is extended over his foe's arm. Turning to the opponent's side or rear and pushing him out of the ring. Striking the opponent's body palms-first to push him to the ground. 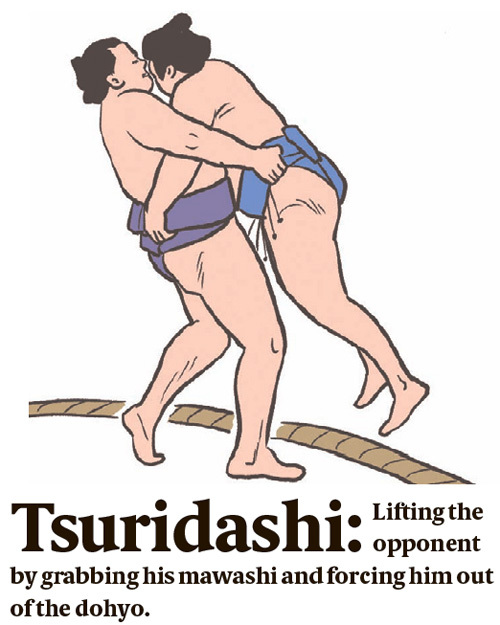 Pushing the opponent down to the ground by exerting force on his upper torso. Kicking the inside of the opponent's ankle with the sole of the foot while pulling the opponent's shoulder to force them off balance. 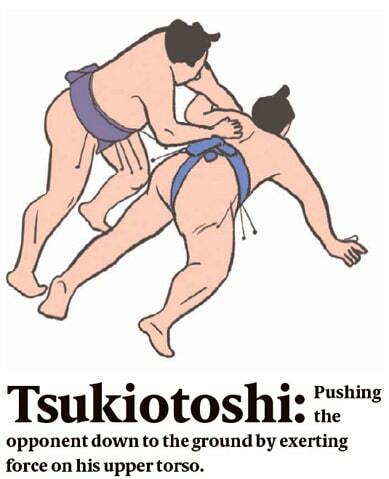 Pushing the opponent forward or laterally to force him out of the ring with grabbing the mawashi (belt). One of the most popular techniques.